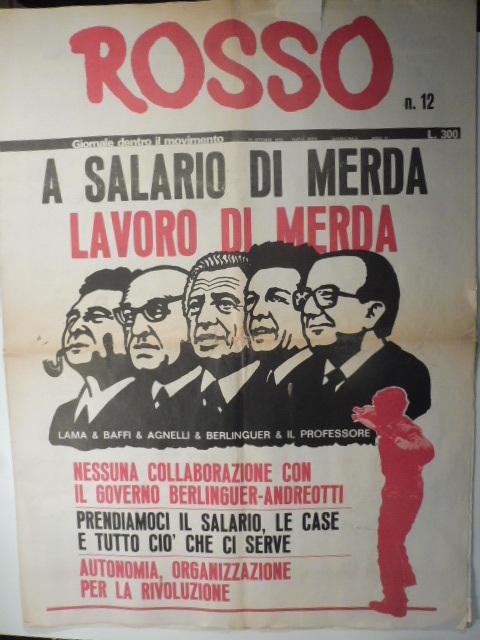 In March 1973 on the initiative of some militants of Potere Operaio who left that organization following the Rosolina conference in the same year, and others coming from Lotta Continua and the area of autonomy the bimonthly journal Rosso begins publication. A wide area of debate emerges around this publication between 1973 and 1977 in both Northern Italy and the Center-South of the country. The illegal aspect of this area of debate carries out various armed actions which are claimed with a diversity of signatures; Never Again Without A Rifle, Without Truce for Communism and Armed Struggle for Communism. However the Communist Brigade had already claimed responsibility for a February 1st 1977 attack on the offices of Face Standard in Milan. The activity of the BC reaches its peak between November 1976 and the Spring of 1977. During this period actions are taken in various areas. -Against off the books employment: Assaults and raids on companies and small businesses, proletarian expropriations of supermarkets and clothing stores. -Against stations and barracks of traffic police and carabinieri and against DC offices. -Against prison facilities ( Avellino, Bergamo and Verbania). In the Summer of 1977, the Communist Brigade splits as a result of a discussion on the ways of conceptualizing the armed organization. Some militants go on to form the Combatant Communist Formations. Others disperse into various organizations between 1977 and 1979 including: Armed Proletarians for Communism, Red Guerrilla and Front Line. The state investigates 85 people for involvement in the Communist Brigade.